Pope Calls the 1915 Tragedy A "Genocide"
Assyrians and Chaldeans are Not Arabs! (ZNDA: Austria) On 29 August twenty six members of the Assyrian-German youth group of Mesopotamien Verein Augsburg visited Berlin. The city of Augsburg was founded in 15 BC under the Roman Emperor Augustus. During the 15th and 16th centuries as a result of international trade and the banking business of the Fugger and Welser merchant families, it achieved international fame. 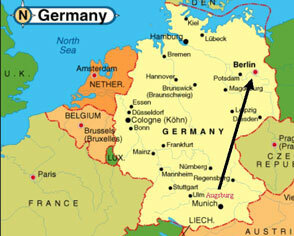 It has a population of almost 250,000 and is located northwest of Munich. At our hotel in Berlin we met with the leader of the Assyrian Union in Berlin, Aziz Said. The first day was free for all, so some of us went to the city of Berlin, others stayed at our hotel. We decided to visit some important historic sections of Berlin. So we went to Siegessäule, Brandenburger Tor, Reichstag, Berliner Mauer, a museum about near the Checkpoint Charly. In the evening we talked together with Aziz Said about the Assyrian clubs and their activities for the youth. It seems to be very critical that many things should be changed. The clubs have to be more active. The night was again free for all. So some of us went to the cinema in the new Sony-Center, other went to cafes and conversed, others went to Kreuzberg or Berlin City. Malfono Gabriel Afram who was invited as a special guest arrived from Sweden. Together we went to the Pergamon Museum. Our youth saw their own history- alive before their eyes. We could see the great history of our fathers. The most famous artifact was the Ishtar Gate. It is simply fabulous. The visit to the Pergamon Museum took about two hours. After that we went to Berlin Dom, the great church in Berlin. The evening was again free. 31st of August was the most important day for all. It was incredible for some of us to witness how much power the old Assyrians had. The morning started with Malfono Gabriel Afram's talk. He told us about the Assyrian language and how it is very important for all of us to speak and write in our language. It was important that our youth could hear about the importance of our language. We hope he can come again to visit us in Germany. At 4 in the afternoon Shlemon Yonan talked about the Assyrian History, past and present. It was interesting to know that only about 15% of the tablets have been translated. Many things about our history and about us will be revealed in the next years. In the evening we stayed in the Assyrian Union of Berlin. Some families came there to visit us. We talked about our trip in the Assyrian Union and after that we drove home. It was a great trip. Next year maybe we will visit London. Special thanks to Aziz Said, Shlemon Yonan, Gabriel Afram, the Assyrian Union in Berlin and to the leader of the Assyrian Youth of Augsburg, Besim Önat. Besim spent a great deal of time with the younger kids. To learn more about Augsburg visit: http://www.augsburg.de/Seiten/augsburg_e/index_e/index_e.shtml. (ZNDA: Ankara) Archaeologists have found evidence that appears to support the theory that a catastrophic flood struck the Black Sea region more than 7,000 years ago, turning the sea saline, submerging surrounding plains and possibly inspiring the flood legends of Mesopotamia and the Bible. In their first scientific report, the expedition leaders said a sonar survey in the sea off Sinop, a city on the northern coast of Turkey, conducted in summer 2000, revealed the first distinct traces of the pre-flood shoreline, now about 500 feet underwater. At one site, the Sonar detected more than 30 stone blocks on a gently sloping but otherwise featureless bottom. Further investigation with remote-controlled cameras revealed pieces of wood and other objects, possibly ceramics. The site "appeared uniquely rectangular" in the sonar image, and the stone blocks did not appear to be part of a natural geological formation, scientists reported in the Oct. 1 issue of The American Journal of Archaeology. Chemical evidence seemed to show that the site was once occupied by people. "The expedition clearly has found a subaquatic landscape with materials that belong to the period before the inundation," said Dr. Bruce Hitchner, an archaeologist at the University of Dayton, Ohio, and editor of the journal, a publication of the Archaeological Institute of America. "They have confirmed an important element of the flood theory, quite convincingly I think." (ZNDA: Chicago) One week after the destruction of St. John Assyrian Church of the East parish in Chicago, U.S. Sen. Richard Durbin is preparing to introduce a resolution in the Senate next week condemning the bigotry and violence against the victims of the hate-crime, Assyrians and Sikhs in particular, since the Sept. 11 terrorist attacks. The resolution also asks authorities to prosecute all those who commit hate crimes. Two Assyrian churches were the target of such attacks during the weekend of Sept. 22-23. A note left at an Assyrian church in Roselle asked, "Are you with U.S. or with the enemy?" And someone set a fire at St. John's Assyrian Parish, causing at least $200,000 in damage. "I couldn't believe it," said church member Joey Joseph, 19, wearing a "God Bless America" T-shirt. "Why would they burn my church?" He pointed to the singed wooden walls, the melted red plastic that hangs over the entryway and to the wooden cross there, which didn't burn. Investigators are trying to determine whether the arson qualifies as a hate crime. An interfaith group, made up of Buddhists, Christians, Hindus, Muslims and Sikhs, showed up at St. John's on Sunday to offer support. Germaine Malick, an Assyrian Roman Catholic, came to show her support. Afterward, she walked up to Shiva Singh Khalsa, who is Sikh, and grabbed his elbow. "I'm not from this church either, but I'm so happy to see all of you people," Malick told Khalsa. "We're Americans," he said. "And we're neighbors. And we're not afraid to show up here." (ZNDA: Yerevan) On the last day of his stay in Armenia last week, the Pope used the term "Genocide" in English in a joint declaration signed with Armenian Apostolic Patriarch Karekin II. "The extermination of 1.5 million Armenian Christians, in what is generally referred to as the first genocide of the 20th century, and the subsequent annihilation of thousands under the former totalitarian regime, are tragedies that still live in the memory of the present-day generation," the document states. Turkey has opposed the use of the term "genocide" to describe those events, and states that there were only 300,000 victims and that they died "in the course of deportations that took place in the framework of the First World War." the same with the Vatican. (ZNDA: Göttingen) The German version of the three-volume documentary series "The Hidden Pearl. The Syrian Orthodox Church and its Ancient Aramaic Heritage" was completed on September 19, 2001, and will be published by "Trans World Film Italia" (TWFI) in Rome, Italy, in early October. Accompanied by three video cassettes (one hour each), they will be available through Syrian Orthodox Parishes and Syriac-Aramaic Associations in the various German speaking countries. Likewise, the series will be available in Dutch, Turkish, Swedish, Syriac and Arabic. The authors of this multi-language project are Prof. Sebastian Brock (Oxford University), David G.K. Taylor (University of Birmingham) and Witold Witakowsky (University of Uppsala). The documentary videos were produced by TWFI for the Syrian Orthodox Church of Antioch and the Syriac Universal Alliance (SUA). Alf Oezen, a German theologian at the University of Göttingen, prepared the German translation. The coordinator for the project in Germany, Gabriel Rabo, provided expert knowledge on the topic. The first part of the series deals with "The Antique Aramaic Heritage", the second part with "The Recipients of the Ancient Aramaic Heritage"; the third volume discusses the current situation of the Syrian Orthodox Church at the beginning of the new millennium. All three volumes and the video cassettes provide a general overview on the different facets of the past, present and future of the Syriac Aramean People in the various regions of the world. The original English version of "The Hidden Pearl" was already published in April 2001. In May, the producer of the video material, Giacomo Pezzali, presented two copies, bound in heavy leather, to the Patriarch of the Syrian Orthodox Church of Antioch, Mor Ignatius Zakka I. Iwas. One of the copies was subsequently forwarded by the Patriarch to Pope John Paul II., the head of the Roman Catholic Church, during his visit to the Syrian Orthodox Patriarchate. (ZNDA: Göttingen) Mitte September 2001 wurde die deutsche Fassung der dreibändigen Dokumentarreihe "Die verborgene Perle, Die Syrisch-Orthodoxe Kirche und ihr antikes aramäisches Erbe" fertiggestellt. Im Oktober werden die Bücher von "Trans World Film Italia" (TWFI) in Rom gedruckt und zusammen mit drei einstündigen Video-Dokumentationen bei den syrischen Kirchengemeinden und syrisch-aramäischen Vereinen im deutschsprachigen Raum käuflich zu erhalten sein. Die Werke werden zur Zeit auch ins Niederländische, Türkische, Schwedische, Syrische und Arabische übersetzt. Verantwortlich für die deutsche Fassung zeichnet Dipl.-Theol. Alf Özen, Georg-August Universität Göttingen. Die Koordination des Projekts sowie die fachliche Beratung lag in den Händen von Gabriel Rabo (Wissenschaftliche Kommission des Filmprojektes). Autoren des Großprojekts "The Hidden Pearl, The Syrian Orthodox Church and its Ancient Aramaic Heritage" - so der englische Originaltitel - sind neben dem bekannten Syrologen Prof. Sebastian Brock (Universität Oxford) noch David G.K. Taylor (Universität Birmingham) und Witold Witakowsky (Universität Uppsala). Die Dokumentarfilme wurden von TWFI im Auftrag der Syrisch-Orthodoxen Kirche und der Syriac Universal Alliance (SUA) produziert. Der erste Teil der Dokumentarreihe behandelt "das antike aramäische Erbe", der zweite "die Empfänger des aramäischen Erbes"; der dritte Band beschäftigt sich mit der heutigen Situation der syrisch-orthodoxen Kirche "an der Schwelle zum 3. Jahrtausend". Geboten wird ein allgemeiner Überblick über das aramäische Erbe in Vergangenheit, Gegenwart und Zukunft. Das Werk ist ein Kompendium mit zahlreichen Bildern und wendet sich gleichermaßen an interessierte Laien und Fachleute. Die englische Ausgabe der drei Filme und der Bücher erschien bereits Ende April 2001 in Rom. Der Filmproduzent Giacomo Pezzali überreichte das erste Exemplar, eingebunden in speziellem Leder, im Mai 2001 in Damaskus dem Patriarchen der Syrisch-Orthodoxen Kirche von Antiochien, Mor Ignatius Zakka I. Iwas. Das zweite Exemplar schenkte der Patriarch dem Oberhaupt der Katholischen Kirche, Papst Johannes Paul II., bei dessen Besuch im syrisch-orthodoxen Patriarchat. (ZNDA: Chicago) Nixon Odisho, an Assyrian from Hanover Park accused of trying to kill his ex-girlfriend by stabbing her more than 16 times, is unfit to stand trial, prosecutors said last Tuesday. Psychiatrist Stafford Henry, who works at Cook County jail, came to that conclusion in a report about 26-year-old Nixon Odisho, whose last known address was 7410 East Ave.
Cook County Judge John Scotillo will review the report at a fitness hearing today. One option for the judge would be to commit Odisho to a mental health hospital. Earlier this month, Odisho pleaded not guilty to the attempted murder of his 24-year-old ex-girlfriend, a South Elgin resident. Cook County sheriff's police said he stabbed the woman on July 9 during an argument as the two sat in her parked car on Lake Street near Bartlett. Witnesses heard the woman calling for help, police said, then, saw her fall out of the car. Police say that's when Odisho sped away. He was captured a few hours later by Kane County sheriff's deputies. Odisho was pulled over for speeding on Route 20, just west of Elgin, police said. On his shirt was what looked like dried blood, prosecutors said. The woman survived the attack, authorities said, but she required more than 75 stitches to her hands and surgery to repair nerve damage. At a previous court hearing, another judge increased Odisho's bond from $150,000 to $2 million after learning Odisho tried to contact the victim at work by making a call from the Cook County jail. "In a follow up to the story about Lina Nissan and her need to raise $180,000.00 to cure her leukemia, which appeared in Zinda Magazine's September 10th, 2001 issue, can you PLEASE mention some important information regarding how donations can be made to the Royal Bank of Canada? Many thanks for consideration and Zinda's support for this young ASSYRIAN girl's life." "I am so fortunate to have access to Zinda Magazine, I really enjoy reading the informative articles. I would like to congratulate you for excellent job." ASSYRIANS AND CHALDEAN ARE NOT ARAB! "I was reading Time magazine (October 1st issue) today and discovered a grave error in the article titled "As American As. . ." by David van Biema on page 72. In it, there is a chart (Muslims and Arabs in America) describing Arab Americans and their various religions. In it, they lumped Chaldeans and Assyrians under the Orthodox rite. Worse than that, this makes it sound as if Chaldeans and Assyrians are just Christian Arabs! The source for this incorrect info is the Arab American Institute. Please pick up a copy of the magazine (Bin Laden on cover), read that chart, and go to Time.com and write a short letter to the editor pointing out the error. I already did, but we have a better chance of getting a letter printed if they get a lot of letters about the same subject. If you have any questions, please let me know. This is important! Also, please pass this on to all Assyrians and Chaldeans you know! " 2001 6-7 million...and a large portion of them are African America. The aim of the program is to build connections between our Assyrian professionals with that of our college bound Assyrian youths. To this end, we will give interested students and their parents an opportunity to speak directly to professionals in varying fields and businesses and find out what it means, and what it takes to work in the ever-changing and competitive job market of today. Our goal is to provide Assyrian students with a wide variety of information that will benefit them as they navigate through educational and career transitions. This short article is a based on an edited collection of documents from the British Archives showing the problems which the British War Cabinet faced in the Balkans, Middle East and Caucasus regions in 1918. The Eastern Reports provided a useful summary of events in Serbia, Greece, Russia, and Russia in Asia, Egypt, Turkey, Persia, Afghanistan and Palestine. Russia figured very prominently in these documents because of the Bolshevik revolution of November 1917, the signing of the Treaty of Brest Litovsk between Soviet Russia and the Central Powers in March 1918 and the Western Allies concern over the spread of Bolshevism. The Allies landed troops in the Northern Russian ports of Archangel and Murmansk to fight the Bolsheviks. This article will focus on Persia that was supposed to be a neutral and independent nation in the 1914-18 conflict. However the invasion of Turkish, British and Russian forces at various times during the 1914-18 war lead to a violation of Persia's neutrality and territorial integrity. As the Russians withdrew their forces from N.W Persia in December 1917, the question was what to do with the Assyrians. The Russians provided the Assyrians with arms and ammunition and also some Russian officers remained behind as instructors. Obviously the Persians were displeased with the Assyrians being armed. The Persians, therefore, attempted to disarm the Assyrians, which led to disturbances at Urumiah and Tabriz. It should noted that Agha Petros, an Assyrian chieftain, inflicted heavy defeats on the Turks on several occasions. When the Assyrians received the news of the murder of their Patriarch, Mar Shimun, by the Kurdish warlord Simko in March 1918, they then attacked and killed Kurds in Urumiah. As stated above, the Assyrians clashed with the Persians. From April to July 1918, the Assyrians fought valiantly against a combined Turkish, Persian and Kurdish force but running out of ammunition had placed them in a very precarious position. In order to avoid reprisals, thousands of Assyrians escaped from the Urumiah district to Hamadan where some 80,000 refugees had congregated behind the British lines. It is estimated that some 10,000 Assyrians never made it to Hamadan and whose fate remained unknown. One can only assume that they were massacred by the Persians and the Kurds. Many of the Assyrians moved from Hamadan and ended up in the giant refugee camp of Baquba, outside of Baghdad. This document is the property of His Majesty's Britannic Government. Printed for the War Cabinet. RUSSIA IN ASIA - THE CAUCASUS. General Situation. - Mr. Stevens telegraphed from Tiflis on the 5th January [No. 6] that during the past few days the general situation bad become alarming in South Caucasus. Collisions, with much loss of life, were taking place between Russian soldiers returning from the front and Moslem troops, tribesmen, and Persian brigands. A brigade of mixed nationalities was being brined at Tiflis with a view to the pacification of disturbing elements in the affected districts, it was said that Turkish military agents were agitating in various places, trying to incite a general massacre of Armenians. The news from Urumia was very disquieting. The catholic Chaldean bishop and the orthodox bishop had come to Tiflis to appeal for protection; they described the situation as a very gravy one. According to them Persian bandits and Turkish Kurds were combining with the object of assassinating the whole Christian population directly the Russian troops were withdrawn. This massacre, they said, could only be averted either by the presence of a strong military force or by the capture of Mosul. New Cabinet-Sir C. Marling telegraphed on the 19th and .21st January [Nos. 51 and 52 that a cabinet had been formed by Mustaufi-ul-Mamalek. Among the other ministers were Ivlushaver-ul-Mamalek. Mnkhbar Sultaneh, the latter's brother Mukbbar Mulk, Sardar Assad, Moin-ul-Vezare.h, and Motamin-ul-Mulk, who had the ministries of foreign affairs, justice, finance, posts and telegraphs, public works, an(l eduvat ion respectively. In a previous telegram [No. 41] sent on the 16th January, Sir C. Marlinix bad said that if Mustaufi-ul-Mamalek were successful in forming a cabinet, the combination would be so feeble and timid that its only use to us would be its affording an occasion for a declaration of our friendliness, and of our readiness to come to terms on questions in dispute. Political circles were agreed that such a cabinet could not last. General Situation.-Sir C. Marling telegraphed to Sit P. Cox on the 19th January in regard to the general situation in Persia. The Shah, he said, had no consistent attitude: he was in a state of abject fear and was remitting his savings to Europe. Unless the pro-German extremists got in to office, no cabinet would go far in active hostility or active friendliness Persians were always ready to go with the side that showed strength but were too timid to commit themselves deeply. When the Turkish and German ministers should have returned with a large number of agents, there would be a danger that they might succeed in bringing about a rupture of relations between Persia and ourselves by working with the reckless extremists: to guard against this an endeavour was being made to render that coup impossible by the creation of a feeling in the moderate democrats in favour of good relations with us. German and Turkish Ministers.-Sir C. Marling telegraphed on the 17th January [Nos. 45 and 40] that information bad been received of the impending arrival of the German and Turkish ministers. General de Candolle at Novo Cherkask and the consul at Rostov had been requested to take all possible steps to prevent them passing through the Caucasus; but the military attache at Tiflis thought it doubtful whether effective measures could be taken at Baku, which was almost entirely Maximalist. The Christians of Urumia.-Sir C. Marling telegraphed on the 17th January [No. 43] that the governor-general had sent 300 Karadagh horsemen to Urumia to protect the lives and property of Christians; it was however generally believed that these tribesmen would be the first to loot and murder should the opportunity arise, a belief shared by Sir C. Marling himself. The Persian Cossacks were recruited from the worst characters in the town and their commandant was said to be inefficient; so they too were unreliable. It seemed impossible for the Persian authorities to take really effective measures ; that the more that they have to deal, in a district where they have very little prestige or authority, with wild Moslems who hate Christians, as well as with some thousands of lawless Christians from over the frontier whose behaviour has not always been too good. [to be continued in the next issue]. Beloved MA/KHOO/ZA Masculine My beloved waits for me: Makhooztee bis/pa/ree/la. We would like to congratulate Dina Bit-David in her courage, achievements and success. Dina was born on July 29, 1980 in Tehran, Iran. When she was five years of age her father Dr. John Bit-David a professor in pure Mathematics was sent to do research at Monash University in Melbourne, Australia and the family moved with him. After staying in Melbourne for one year, the family moved to Sydney and this is where Dina, her parents and a younger brother Raman still reside. Dina is currently a third year student at the University of Western Sydney (Nepean) where she is doing a double degree in Communications and Law as well as being the Editor-in-Chief for the University's magazine. Beside her success in furthering her education, Dina has a great passion for singing. Her mother quotes that "from the age of two years old Dina would sing and pretend that she was on stage performing for a large audience and since then nothing could stop her for the love that she has for singing". Dina has won many trophies including this year's First Place at the National Karaoke Championships in Brisbane. She has also performed at many different events for Assyrian organisations, such as The Assyrian Charity & Educational Community (ACEC) and The Assyrian Australian Academic Society (TAAAS). Dina's most recent challenge was to get a role in a musical show called 'The Wizard of OZ'. After many auditions against stiff competition she was finally selected to take up the main role for the character of 'Dorothy'. The show will be staged at The Seymour Centre (a famous theatre in Sydney) from 3rd October - 20th October. Benefits from the show will go to the charity organisation 'MAKE A WISH'; a foundation set up to provide 'wishes', hope, and support to sick and underprivileged children. Despite the many obstacles that have faced Dina in her pursuit to do what she loves most, she has finally reached a moment in her life where her dreams are becoming reality and success is within her grasp. Dina has always held the belief that you should " listen to your heart and make your dreams come to life". The Black Obelisk of King Shalmaneser II of Assyria is made of black marble, five feet in height, found by Sir Henry Layard at the Mound at Nimroud, and now in the British Museum. Each of its four sides is divided into five compartments of sculpture representing the tribute brought to the Assyrian King by vassal princes, Jehu of Israel being among the number. Shalmaneser, whose annals and conquests are recorded upon it, was the son of Assur-Nasir-pal, and died in 823 B.C., after a reign of thirty-five years. A translation of the inscription was one of the first achievements of Assyrian decipherment, and was made by Sir. H. Rawlinson; and Dr. Hincks shortly afterward (in 1851) succeeded in reading the name of Jehu in it. M. Oppert translated the inscription in his "Histoire des Empires de Chaldee et d'Assyrie," and M. Menant has given another rendering of it in his "Annales des Rois d'Assyrie" (1874). A copy of the text will be found in Layard's "Inscriptions in the Cuneiform Character" (1851). A Kurdish force of 10,000 attacks Urmia, Iran and kills, looted and carried off over 1000 Assyrian prisoners. Soon after this, the Turkish Pasha of Rawandoz sacks the villages of Alqosh and Tel Kepe, and pillaged the monastery of Rabban Hormizd, killing many monks and one bishop. Mar Ishai Shimmun, Patriarch of the Church of the East, accompanied by Yosip Malik arrive in Geneva at the headquarters of the League of Nations to discuss the Assyrian Question.